Grass Seeds are a danger to your Pet. The signs of a grass seed varies greatly. Sometimes what we see is as simple as matted hair or local swelling. However, a seed in the ear canal may cause intense irritation and pain with head shaking, ear scratching and rubbing on the floor, or a head tilt. In the eye, closed eyelids and heavy tear production, or constant pawing at the affected eye can be seen. Sneezing and nasal discharge will result from some intra-nasal grass seeds. Lameness from foot infections are common when they penetrate the toes. Excessive licking accompanies attachment to the gums, tongue and mouth. Pets with seeds in the back of the throat may cough, retch, or gag, and have difficulty eating and swallowing. Keep hair clipped close to help prevent grass seed attachment. Dogs with floppy ears should have the hair clipped short on the inside of the ear flap and at the entrance to the ear canal. Protective vests that cover the chest and abdomen are commercially available. Check dog over thoroughly after time spent in area prone to seeding grasses. 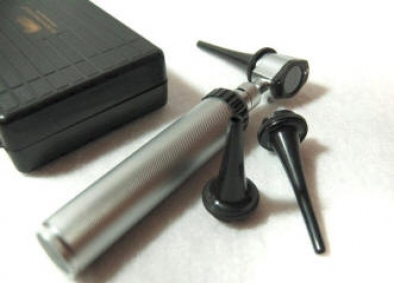 Use an otoscope to light and magnify the ear canal of your pet. 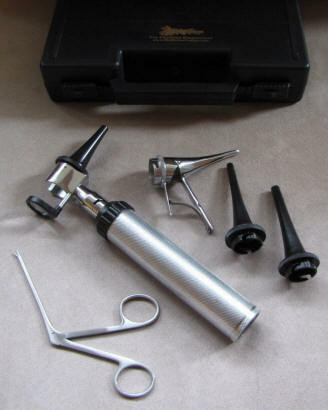 This will allow you to perhaps remove it before it has the time to work its way further into the ear canal causing more problems and expense....not to mention time wasted in a trip to the vet. 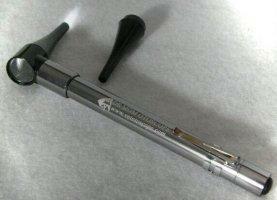 Aussie Otoscopes offer 3 Vet Otoscopes. The slimline model has an LED module as its light source. The LED module is very durable and is guarenteed to never burn out as there is no filament to break. There are two Halogen Professional Vet Otosocpes. Click on a picture to find out jor to order that item.